Great Care, Delivered. Ask your veterinarian these questions about compounded medications. Prescription compounding is a rapidly growing component of many veterinarians’ practices. This is in large part because relatively few drugs are manufactured just for veterinary use. So veterinarians often must turn to medicine that is manufactured for people. Some vets may not realize the extent of the specialized medications and dosage-forms that modern compounding pharmacies offer. Ask your veterinarian these questions about compounding. If you have a prescription for a compounded medication, get in touch with a compounding pharmacy — one that is committed to providing high-quality compounded medications in the exact dosage-form and strength prescribed by your veterinarian. 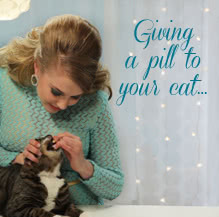 We offer at least ten ways that may make it easier for you to give—and for your pet to take—it's medicine. What can you tell me about compounded medications? Do you ever prescribe compounded medications for your patients? When? 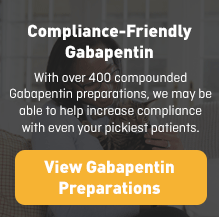 Is there a compounded preparation in a different dosage-form or flavor that would make it easier for me to give and for my pet to take its medicine? If the drug my pet is now taking were taken off the market, is there an alternative way to continue its therapy? Why do you recommend that pharmacy? Does the pharmacy specialize in compounding? Does the pharmacy have a good safety record with making compounded preparations for pets? Does the pharmacy have systems in place to make sure compounded prescriptions are exactly as the veterinarian orders them? Does the pharmacy have proper facilities for making sterile prescriptions? Print this page and show it to your veterinarian! Take the time out of pilltime: 10 ways to help the medicine go down. When your veterinarian prescribes a medication for your pet, Wedgewood Pharmacy offers you more choices than any other pharmacy to ensure that they take the medications the doctor ordered. We compound hundreds of medications in familiar dosage forms like capsules, chew treats, oral liquids, pastes, powders, and transdermal gels. And most of our oral medications are available in flavors ranging from apple to watermelon to make the medication as tasty as possible. Bitter-Block—Using a proprietary process and food-grade materials, we coat each particle of medications before it's pressed into a tasty, chewable Gourmeds tablet. The soluble, temporary coating protects the taste buds from the bitterness of the medication while allowing the yummy chicken-flavor to do its job. 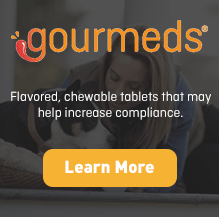 Gourmeds—Gourmeds chewable tablets in natural chicken and fish flavors for dogs and cats and apple-molasses; peppermint and alfalfa flavors for horses. Granules—Compounded granules help to reduce the risk of chemical exposure to you, compared to powders. The amount of dust produced when administering the preparation is reduced, thereby helping to decrease the risk of exposure. Medi-Melts—Look like standard tablets, but are lightly compressed so they disintegrate rapidly on an animal's tongue, creating a paste that can't be rejected. For sicker animals that may have difficulty swallowing, or for animals that reject any medication, this may be the perfect solution for medication compliance and the tasty flavor makes it seem like a treat. POLOX-A-GEL—Stores as a liquid while refrigerated, resolves into a gel at room or body temperature so the preparation stays on the patient longer. Quad-Tabs—Now you can get up to four doses from each tablet. Tiny Tabs—Tiny, compressed tablets, perfect for difficult-to-administer or bitter-tasting medications. Twist-a-Dose—When oral medications fail and you need simple, accurate dosing every time. Twist-a-Taste—A different "twist" on oral gel applications. This content is intended for patient counseling purposes only. This content is for informational/educational purposes and is not intended to treat or diagnose any disease or person. No claims are made as to the safety or efficacy of mentioned preparations. The compounded medications featured in this piece have been prescribed and administered by physicians who work with Wedgewood Pharmacy. You are encouraged to speak with your healthcare provider as to the appropriate use of any medication.